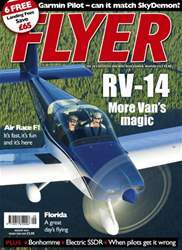 This month in FLYER, Ian Seager flies the Van's RV-14A, an easy-to-build, spacious aircraft with rock-solid handling, capable of ‘gentleman’s aeros’ – the latest in the long line of Van’s best-selling kits, and asks if it’s another winning design for them. Head to Spain with F1 racer Des Hart, where he fought an exciting battle with other racers in the inaugural Air Race F1 event in Catalonia. Elsewhere in the issue, we report on the FLYER 20th anniversary fly-in, check out an electric conversion for the Aviad Zigolo SSDR that's flying in the US, and talk to the UK's most disabled pilot Nathan Doidge. Add in a dawn-to-dusk flying adventure in Florida where Ian Seager meets a group of Van's RV owners and builders, the chance to save £65 in landing fees, the latest news, comments, events and much more, and you can see why FLYER is the brightest and most-read GA title in the UK.